Landscape from Lejre, 1905 (oil on canvas) by Hammershøi, Vilhelm (1864-1916) © Nationalmuseum, Stockholm, Sweden. Lejre is on the Zealand(Sjælland) island not far from Copenhagen and it is where Hammershøi often stayed in the summer. 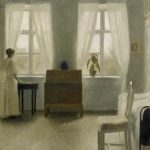 Although he painted landscapes less frequently, this painting displays the obvious elements of Hammershøi’s style. 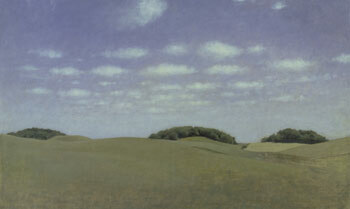 For example, the focus is on the foreground with only glimpses of the trees and rolling hills behind, showing that elusive nature in his work. 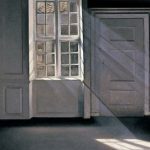 There are also no people shown, even though they may have been present at the time of painting, leading to that general feeling of emptiness and isolation.